It's pancake day! The most wonderful day of the year! I know I could actually eat pancakes whenever I want, because I am a grown up and they are so simple to make, but it's special on pancake day - the world gives you an excuse to have sugar and whipped cream for dinner, and to feel good about it. My favourite pancakes are super thin crepes (this recipe) drizzled in lemon and sugar, but I'm also partial to an over-the-top ridiculous american-style pancake. This year I think I'm actually going to use the excuse of lent (despite not being religious at all) to give up refined sugar and fried foods until Easter... I want to shake off my sluggish winter feelings! So, as this is my last chance to be super indulgent for a while, I'm really looking forward to tonight's tea. 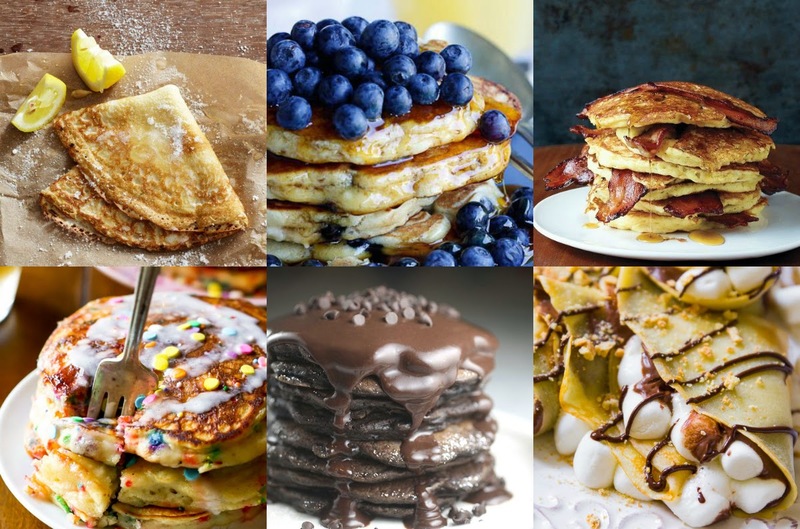 Here's a few pancake recipes from Pinterest that look seriously good!